Or are the rumors that they’ve gone clear over the edge true? 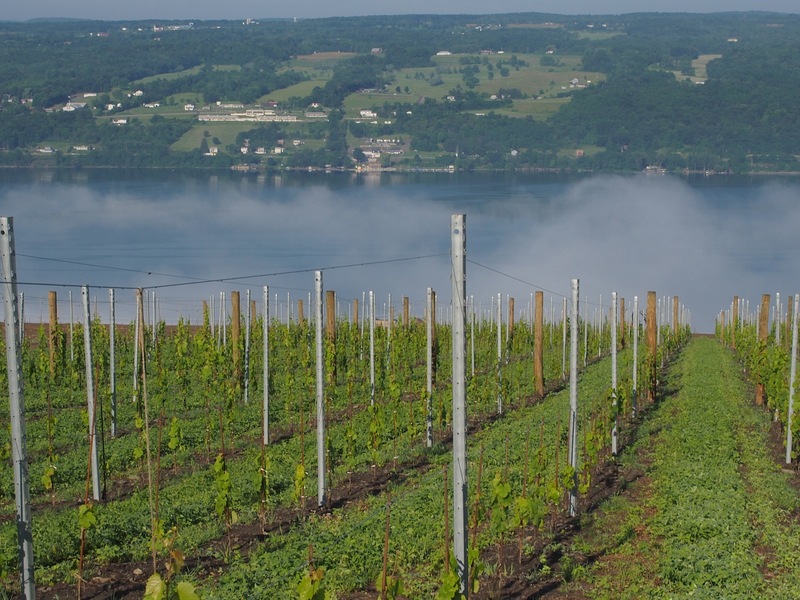 This is the sight that greeted me at 8am this morning at the beginning of my tour of the new vineyard that California-based flying winemaker Paul Hobbs and Mosel winemaker Johannes Selbach of Selbach-Oster are in the painful process of establishing close to Watkins Glen on the east bank of Seneca Lake in the FLX. 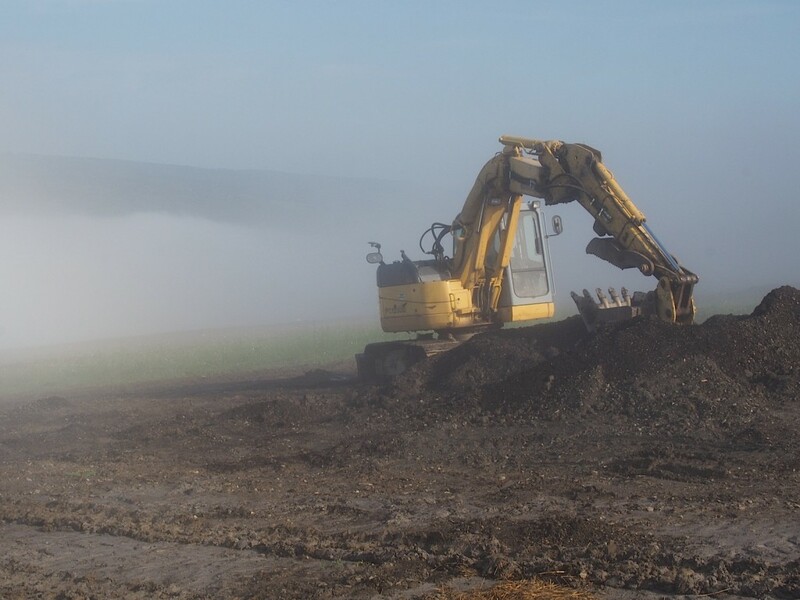 The lake was hidden behind a bank of fog and that’s just one of the pack of mechanical diggers that the team has been used to clear this hillside, dig an extensive drainage system and prepare the ground for the planting of tens of thousands of Riesling vines. The first reason this process has been painful is the massive recent rainfalls here – again last night as I made my way to the site – that repeatedly interrupted planting. 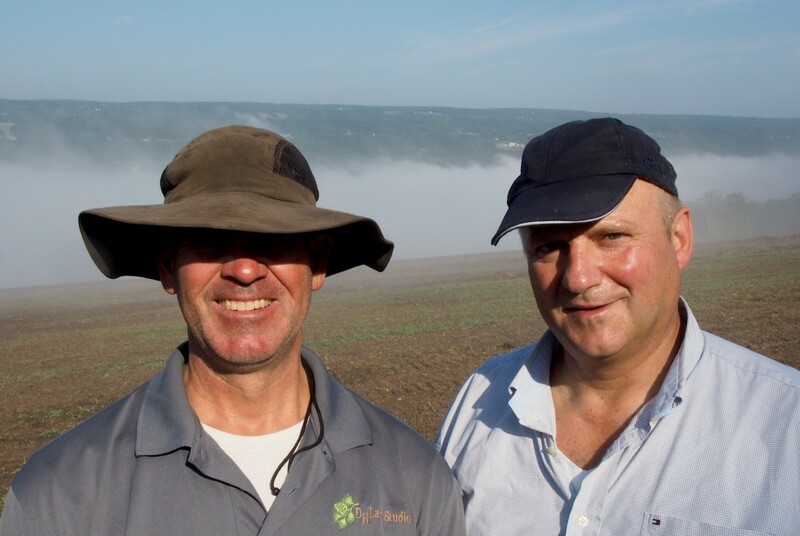 That means it’s now a major challenge for the team headed by Paul Hobb’s brother David, the project manager (left in the picture below), to get all the Riesling vines into the ground early enough that by fall they will be hardy enough to survive the first frosts. Johannes Selbach (right in the picture below) has done all he can, but because of his commitments in Germany and elsewhere around the world he con only be here for relatively short periods, one of which ended this morning. 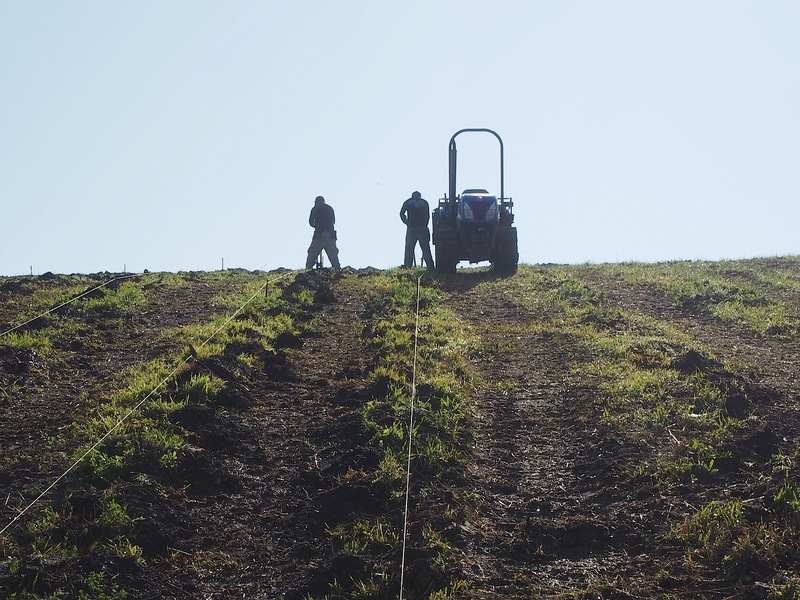 The above picture shows the 2.5 acre initial planting established last year, and gives a good idea of how the finished vineyard will look, however please bear in mind that this is the upper section of the site where it is least steep. This scene also remind me of the Mosel, but there are some crucial differences between the two, the FLX having a shorter and more intense vegetation period, followed by a longer and much harder winter than the Mosel ever experiences. Johannes was here in February, (just a few weeks before I was last here in early March), so experienced the worst cold of the worst winter here in a long time. As he said to me, “if I learnt anything it’s that the time window for doing everything in the vineyard here is narrower than back home, and we have no choice but to use that narrow window.” David has been thinking up some radical ideas to optimize the shortest of harvesting windows, but before these have been tested in the vineyard I can’t reveal them. 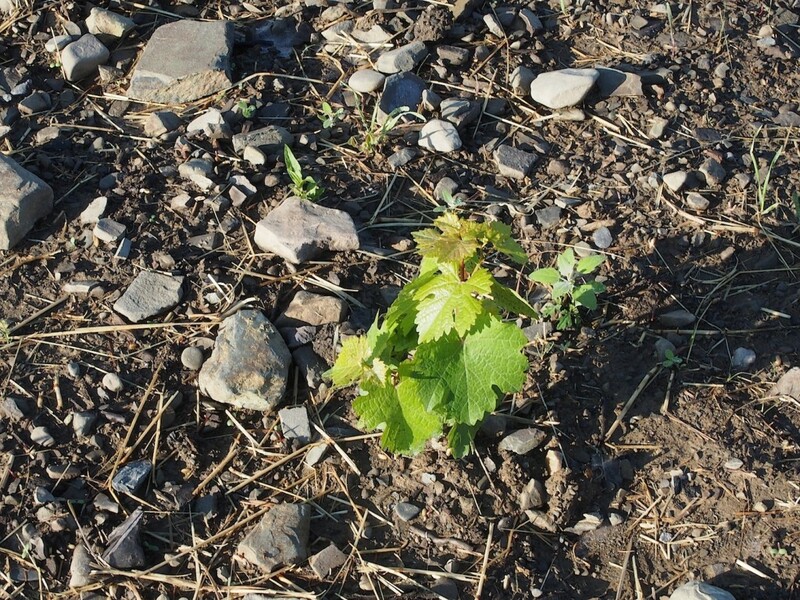 However, even if this kind of innovation works out making exciting Riesling wines here will still be a high-risk venture that will make the hearts of those involved race during the crucial hours of the harvest. Because this is a story that is unfolding as I write these lines further episodes will follow. They will stretch over several years, because according to the current plan only the northern end of the site will be almost fully planted this year, but the southern end will have to wait until 2017 before it can be planted. Then there will be a total area of 50 acres, entirely devoted to Riesling. Anyone doubting the arduousness of this endeavor is recommended to study the above picture, showing the manual planting of vines in the steepest section of the site. I’ve done this work myself (back in May 2013 close to Berlin), but that was on a much more gentle slope and I was shattered at the end of the day. GOVERNMENT HEALTH WARNING: DON’T ATTEMPT THIS PROCEDURE IN YOUR BACK GARDEN!